Oil traded near $41 a barrel after U.S. gasoline supplies fell the most since April, retreating from the highest seasonal level in at least two decades. Futures were little changed in New York after advancing as much as 1.4 percent earlier. Prices climbed 3.3 percent on Wednesday, the most in three weeks. Inventories of the motor fuel slid by 3.26 million barrels last week, according to data from the Energy Information Administration. Crude output fell for the first time in four weeks, while stockpiles unexpectedly expanded. Refinery rates and crude imports rose. Oil rebounded after tumbling more than 20 percent into a bear market, closing below $40 a barrel on Tuesday for the first time since April. Citigroup Inc. to Bank of America Merrill Lynch predicted the slump would be short-lived, while Societe Generale SA said the price correction would be limited due to a better balance between supply and demand. West Texas Intermediate for September delivery was at $40.90 a barrel on the New York Mercantile Exchange, up 7 cents, at 9:04 a.m. London time. The contract climbed $1.32 to $40.83 on Wednesday, the biggest gain since July 12. Brent for October settlement was 8 cents lower at $43.02 a barrel on the London-based ICE Futures Europe exchange after climbing as much as 1.3 percent earlier. Prices rose 3.1 percent to $43.10 a barrel on Wednesday. The global benchmark traded at a premium of $1.36 to WTI for October. U.S. crude output decreased by 55,000 barrels a day to 8.46 million a day, the EIA reported Wednesday. Nationwide inventories expanded by 1.4 million barrels to 522.5 million, keeping supplies more than 100 million barrels above the five-year average. 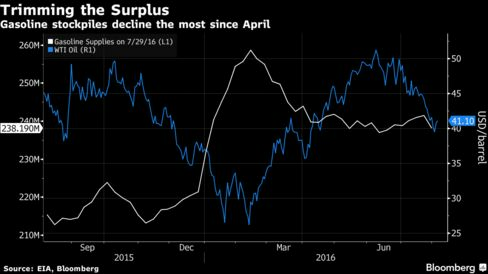 Stockpiles at Cushing, the delivery point for WTI and the nation’s biggest storage hub, fell the most in six weeks. Hurricane Earl is forecast to strike Belize overnight Wednesday as a Category 1 storm before entering Mexico’s Bay of Campeche, where Petroleos Mexicanos operates offshore oil rigs and platforms. Oil traders who specialize in purchasing cargoes from Mediterranean ports view the chances of an imminent resumption of shipments from two key Libyan terminals as almost zero, even after a deal was struck to reopen the facilities. Iran approved a new oil contract model, taking the OPEC nation a step closer to welcoming foreign investment in its energy industry and boosting production even more into an oversupplied market.